It's that time again! I'm a little sad to see summer go this year. We started school on Monday, and it just doesn't seem like it should be time. I have had to keep reminding myself how nice it will be to have a break at the end of May in order to get the motivation to jump back in. I'm not dreading the year. Summer just seemed too short. 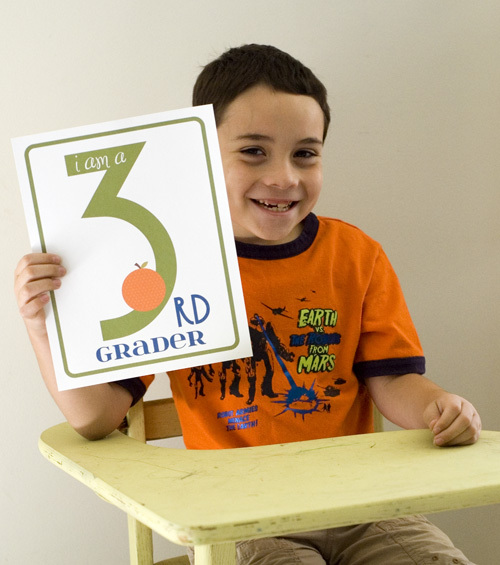 It's also hard to believe that Jonathan is a third grader! He's grown up so fast. Just looking at his snaggle-toothed grin reminds me of how old he's getting to be. I know this year will be an adventure, and one of my biggest goals is to keep Benjamin more engaged. I have lots to share in the coming days about what we're doing for school this year, some of the goals we have set, and ideas for managing those little ones while you're "doing school." Wow... I can't believe it! Time flies, I guess that means we're all getting older. Love you all!